Yesterday, Hasbro revealed the full wave of Thor Ragnarok wave and that wave was nice but it got me thinking what would be a even better wave for Thor. So I decided to bring back a new segment of the site. It’s time for the all new IDEAL WAVES. For those that don’t know what Ideal waves are it is basically creating a list of figure that I would like to see be made into a real waves. Of course I don’t just randomly pick. I look at what is being trending for a while and create a wave based around that. I do set some rules for it. First up is of course Thor in his classic costume. Hasbro have been killing it with the Classic remakes. Look at Classic Cap, Pizza Eating Spidey, Daredevil etc. So I think it’s time Hasbro tries to take a stab at one of the most request classic remakes in Thor. Hasbro already has the body for it with the upcoming Young Thor and SDCC Odinson so just a few re-sculpting and new head and we’re done. 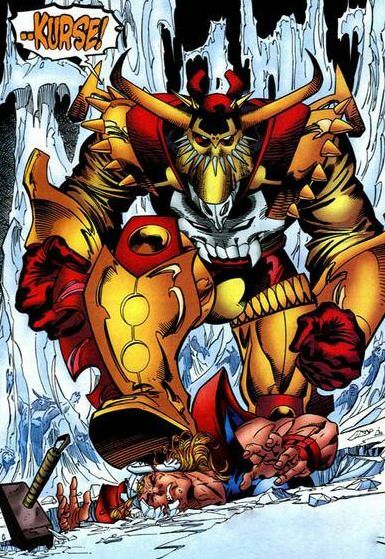 To sweeten the deal and give many people a new character Hasbro could give us Ragnarok Head from the Civil War Story-line. Hell just put Thor’s hair on Nuke’s cyborg head and we are good. Confirmed for the 80th Anniversary set. Another Highly requested character and long sought after Avenger is Eric Masterson a.k.a. Thunderstrike. The former vessal for Thor soon became his own character and a firm fan favourite until his death. While he may look like Thor I think the Tombstone mold would work better for this character. Taking up the only female slot for this wave is Thor Girl. Originally an alien goddess, after an encounter with Thor, she travelled to Earth and fashioned herself after him to become a female version of him (you know before the other one came about). Despite being a goddess she is still young so I’m thinking the Kate Bishop mold would work better for this girl. The break out character of the MCU and we have yet to get a good comic version. TB did one in their time and Hasbro did one (as well as some MCU figure) but none of then really capture the tricker god. I picked the Classic version as it would be the easiest to get by repainting the Spider 2099 buck. The bucky cap could work as well but he should be a slight bit skinnier so that buck wouldn’t work. Next up is Hercules. Now the first Hercules we got was actually one of the best figures of the early Hasbro days (mainly because it was done by TB) and to this day still looks nice. However I’m including it in this wave cause we need a new figure. While the classic and “Siege on Avengers Mansion” version would be nice, I think we should get a more modern version. This figure could use the same mould as SDCC Odinson with sculpted parts. Confirmed for the Avengers Endgame Wave 1 . Even though he is more associated with Captain America and the Serpent Society, King Cobra started out as a Thor villain. Given that there was an number of rumours that he was to come out in the third wave of Cap and the fact that we need more Serpent Society members to company Viper and Copperhead, I think placing him in this wave would be nice. He could use the Bucky Cap build with a new head and cape. Finishing up we have the Build-A-Figure, that being the Dark Elf Kurse. While the MCU may have made him just a side character, Kurse has been one of Thor fiercest enemy and then honourable rival, usually working with Malekith. Plus considering that we now have Malekith in the SDCC set, having this to go with him. This could use a heavy re-sculpted MCU Hulkbuster built but if they can’t use that then the Juggernaut build would work too. Well that the first of the new Ideal waves. What do you guys think? Let me know what you guys would like in a Thor based wave. Also if you have a suggestion on another wave (IE Spider-man) let me know below). Very good fun and interesting to read ‘ideal Thor Wave’, pal, and nicely designed. Surely now we FINALLY must get the classic Excalibur original membership in a wave! 5 main figures and I have a FULL and PERFECT idea for the MLs series, if Hasbro AT LAST do it! Here we go, then – what do you think? esp’y in the many Exc’ team line-ups. But I propose that my suggested ‘MLs Excalibur series’ below includes all of the most important and visually exciting and fun characters and costumes. or maybe Gatecrasher – leader of TechNet. + esp’y as STILL not made and a VERY popular + long-term costume. N.B. An official promo pic’ of this was released by ToyBiz in Giant Man BAF series, and indeed it even appears on that wave’s CB box often in their mini-pic’! Yet we STILL have not got one sadly. Alternative:- CB’s initial red-gold-flag costume. #3) Meggan – with 2 extra, larger arms + her alt’ ugly, monstrous, screaming face – to show her shape-changing. #4) Nightcrawler – in classic costume, + with 3 ‘BAMF!’ teleporting, purple smoke pieces + sword + Widget – as accessories. + ToyBiz figure is FAR too big and NOT pose-able enough for Nc’s acrobatic antics! Alternative:- maybe make his later, pirate-ish looking costume, i.e. with gold, round clasp on left chest. But this design is a dog’s dinner and ugly, TOTAL mess! #5) Shadowcat – in classic blue + grey costume, as in Exc’ issues, + Lockheed. Esp’ as STILL not made! Alternative:- Phasing + mostly transparent, with some blue-grey costume still visible, + a square ‘floor’ piece with a hole cut to pose her figure through. #6) Phoenix 2 – in classic red ‘mutant hound’ costume, as in Exc’ issues. or maybe in her classic red + gold-flame Phoenix costume. or maybe Black Knight – updated figure from excellent ToyBiz figure, + in his Exc’ style. #8) Arcade – as a main enemy of Excalibur AND X-Men – but still NO MLs has been made of Arcade! #9) Mad Jaspers – in his classic checked suit + trilby hat + mad grin! As 1 of Exc’s main foes. Possible alt’s to fill out the Exc’ world in MLs figures:- maybe Roma or Sat-Yr-9 (+ Courtney Ross alt’ head) – as main allies or enemies. There it is, everyone – the PERFECT Marvel Legends Excalibur series, I contend! So, what do you all reckon? Cerise, Pete Wisdom, Psylocke, Sage, Micromax, Kylun, Alister, Merlyn and so many other Exc’ members and foes are just BORING visually and not even important in Exc’ comics – let alone in Marvel comics generally. and it would be a HUGE waste of space, if some of THOSE were instead of my 8 characters proposed above. Also – these 3 MLs box-sets should be produced by 2018 – as important in Exc’ and X-Men. #1) TechNet – team of bounty hunters and the catalyst for Exc’ comics to begin! #2) Crazy Gang – also key for Exc’ and CB; altho’ they’re more insane psycho murdering-for-fun, it seems…. #3) Marauders – inc’ ALL of them and in their classic late 1980s costumes, as in X-Men comics. Do it FULLY + RIGHT 1st-time, Hasbro, please! As my suggested MLs Marauders box-set below would be a true treasure and work of art to behold! Also – so we don’t end up mega-frustrated and disappointed for ages, as how only 3/4 Wrecking Crew were made for a few years – crazily! + Gambit – could include, as c.10 years since last ML Gambit was made, and he caused Marauders to be formed. + showing years later that Gambit had assembled M’s was an exciting, but MASSIVE ret-con cheat, let’s be honest! So – what do you all think to my ideas, then? …if Hasbro creates them – PLEASE do! By 2018, Hasbro!